Intel is yet has to announce its 9th Gen Core processors for laptops officially, but because the company needs to sort out all the things with authorities and regulators well in advance of actual product launches, CPU model numbers and general specifications have been published well ahead of the formal release. As it turns out, recently the company disclosed the first details about its 9th Gen mobile Core i9, Core i7, and Core i5 H-series processors for higher-end laptops. Before proceeding to the actual products, let us make it clear what Intel actually revealed. Among other things, Intel (and other companies) has a number of export compliance metrics for its CPUs, including GFLOPS, Adjusted Peak Performance (APP), and Composite Theoretical Performance (CTP). 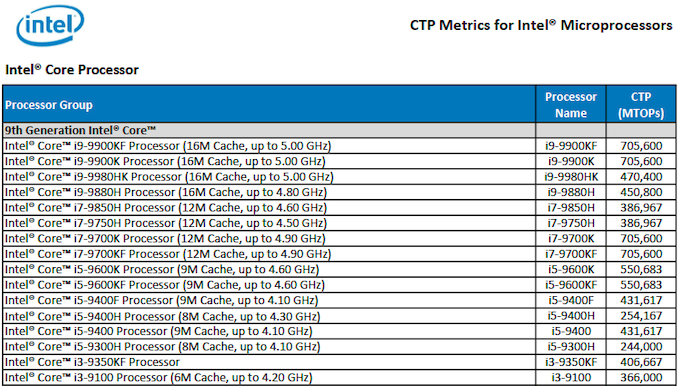 These metrics are used by various governments to determine capabilities of CPUs and other processors. The APP and GFLOPS metrics are used by the US Department of Commerce’s Bureau of Industry and Security (BIS). Meanwhile, other authorities and regulators use CTP calculations, which are stated in Millions of Theoretical Operations Per Second (MTOPS), to assess what companies import to their countries. 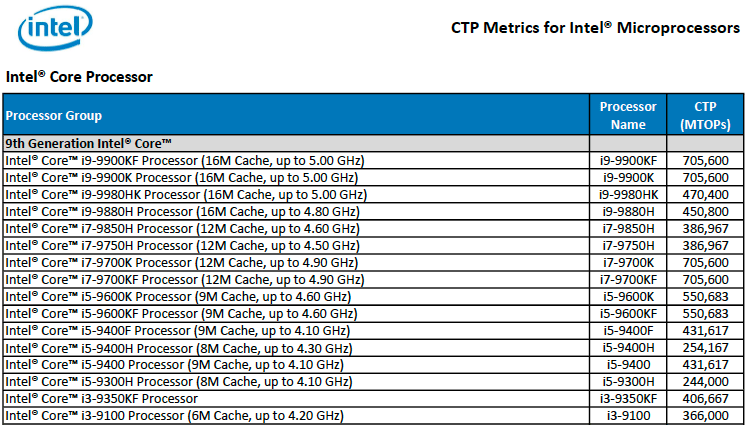 The CTP numbers are the ones that Intel published for its yet-to-be released CPUs. The mobile CPUs newly listed are the eight-core Core i9-9980HK processor with unlocked multiplier, the eight-core Core i9-9880H, the eight-core Core i7-9850H, the eight-core Core i7-9750H, the quad-core Core i5-9400H, and the quad-core Core i5-9300H. All of them are aimed at high-performance laptops for gamers and professionals and, according to Intel, will be launched in the second quarter. Since the new processors belong to Intel’s 9th Gen Core family are designed to feature hardware mitigations against specific Meltdown and Spectre vulnerabilities. Meanwhile, a quick look at the basic specs that Intel published as well as their CTP numbers can shed some light on general specifications of the upcoming 9th Gen Core H-series mobile processors. NOTE 1: Keep in mind that Intel has only published very basic specificationsof its upcoming 9th Gen Core CPUs for notebooks (i.e., Turbo frequency and cache size), which is why a number of details published here (e.g., core count, iGPU) are not confirmed officially at this point. Obviously, the Core i9-9980HK and the Core i9-9980H will sit on top of the range offering eight cores with Hyper-Threading, 16 MB of L3 cache as well as Turbo frequencies close to their desktop counterparts. Meanwhile, the difference between CTP of desktop Core i9 and notebook Core i9 CPUs clearly indicates that their base clocks will be considerably lower, possibly to maintain a 45 W TDP. Intel’s Core i7-9850H and the Core i7-9750H processors will sit below their Core i9-branded brethren. These chips will feature eight cores (without HT) capable of running at up to 4.6 GHz along with 12 MB of L3 cache. Just like in case of higher-end parts, these CPUs will be clocked considerably lower than their desktop colleagues. Surprisingly, as far as the cache size and CTP numbers are concerned, the 9th Gen Core i5 H-series processors will not feature six cores, but will pack four Hyper-Threaded cores with 8 MB of L3. While the Core i5-9300H chip will probably run faster than the Core i5-8300H, the Core i5-9400H will have exactly the same base frequency as the Core i5-8400H as they have the same CTP of 254,167 MTOPS. In addition to mobile CPUs, Intel also disclosed some preliminary details about its entry-level quad-core Core i3-9100 CPU in its document. The chip will run at frequencies of up to 4.2 GHz and will feature 6 MB of L3 cache. Since this is a lower-end part, expect it to be priced accordingly. As always, Intel does not comment on unreleased products, so take every unconfirmed spec mentioned here with a grain of salt. What we do know for sure at this point is that Intel has finalized specs of its 9th Gen Core H-series processors for laptops and, if everything goes as planned, is on track to launch them in Q2 2019. Most likely cooling is the issue, how can a laptop not supply 45w to its cpu? That 8750h is running 6 cores at 2.2ghz base, and i think we all know that intel's tdp is for base clocks not turbo clocks.